LightTable made quite a big fuzz some time ago. Now original authors are working fulltime on Eve, while LightTable is now more driven by community members. And they're doing some pretty interesting work like switching to Atom Shell instead of node-webkit. I like the idea that text editor is a browser. It gives you ability to do literally anything you want. So I decided to integrate React.js into LightTable plugins ecosystem. One of the most interesting things in latest release is User plugin. It is a place to configure your editor not just by tweaking settings and changing keybinding. You can add new features right there without need to create separate plugin. It is much like .vimrc or .emacs/init.el files. This turns process of configuring your editor into development task. First let's add User plugin to workspace. Start LightTable and run command Settings: Add User plugin to workspace, open workspace panel (Workspace: toggle workspace tree command). Now you can see User dir with a some files added already. Let's open User/src/lt/plugins/user.cljs. It already has an example that shows how to make objects and open new tabs. We'll tweak this example to use React.js. 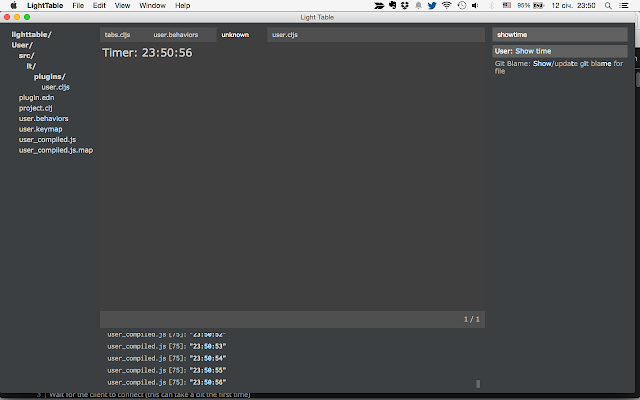 (el "h1" nil (str "Timer: "
Our component, that is going to show whole React.js-LightTable integration. I guess nothing stops us from using om/reagent/quiescent/etc. Add it's dependency in project.clj and you're good to go. Our example is simple enough not to bring anything more than bare React. Here we define LightTable (not React.js) ui component react-panel and object prototype ::user.react-timer. LightTable has it's own notion of object, that it uses to implement BOT principle. When the object react-timer is created function that is passed with :init is executed. This code adds new command to LightTable. It creates new tab, then instantiates React.js component and mounts it on rendered by react-panel node. After that defines refresh-timer function, that updates props in React component. It is called every second as a callback of js/window.setInterval. We could save timer ID in React component's state, but I decided to put it in object, so our component could be simple and it's only purpose would be view layer, while all the business-logic lies separately. Now we're taking care cleaning on our tab close event. This is why I added prn to refresh-timer function - to see if it stopped being called by setInterval. It's been a long time since I posted my useful ppa list. Looking at that list and my current PPAs shows that almost everything changed and I could share my new favourites. ppa:conscioususer/polly-daily is for Polly Twitter Client which is the only usable desktop twitter client under linux for me. PyCharm has nonofficial PPA on UbuntuUpdates. But I prefer to go to it's EAP download page to get fresh build. http://dl.google.com/linux/chrome/deb/ you can't run away from Google Chrome if you're doing web development these days. Here I also use untested version. And also it is a browser I use when some builds of Firefox Nightly has critical issues.